Few modern women have had as great a political impact as Margaret Hilda Roberts, the grocer's daughter from Grantham who, as Margaret Thatcher, became Britain's first woman prime minister. The longest serving British premier of the twentieth century, Mrs Thatcher has been the subject of both adulation and vilification. 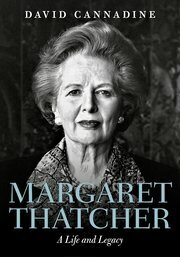 In Margaret Thatcher: A Life and Legacy, the leading historian Sir David Cannadine sets Margaret Thatcher in the context of recent British history. With elegance, wit, and historical insight, Cannadine charts Mrs Thatcher's upbringing and influences, her political career and life after politics, the impact of her policies, and her personal reputation and political legacy. The book also features a glossary of key terms, a chronology, a 'dramatis personae' of significant figures of the period, and a guide to further reading. Written by one of our foremost international historians, it is an essential work for anyone interested in the life and work of a towering—and often controversial— figure in modern British history, as well as students, academics, and researchers in the fields of modern history and politics.